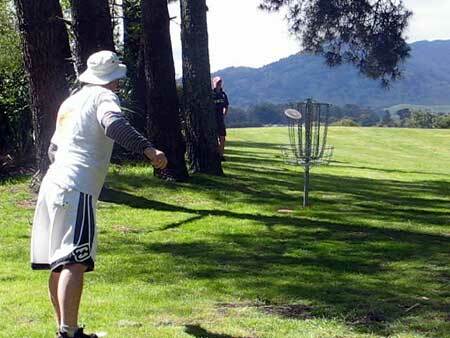 Kiwi and international disc golf players alike were pleased this year to see Spa Park in Taupo down as one of the rounds for the New Zealand Disc Golf Tour. Since this park was used for the 2003 Nationals, comments such as 'best course in the world' were being heard (mind you, that was from Juan Unda after his best ever performance and after a few Macs Golds!). Either way, Spa Park turned it on again in September with some stunning weather for a record number of players for a tour event. 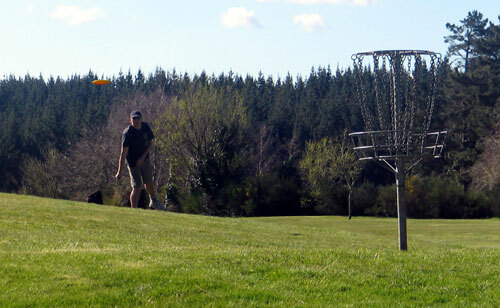 As usual, discgolf.co.nz photographer Len Skap was there to record the highs and lows of the three rounds held over the Saturday and Sunday. Hole 2 and The Dev watches on in admiration as Juan Unda solidly putts yet another birdie in true Mexican style. Mr Serf focuses on a solid drive on five. 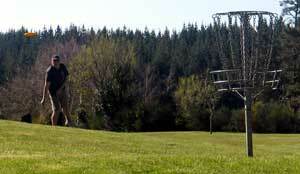 Taumarunui hardman Shane follows through at the tee on hole 5. Hole 5 was a test for all golfers. Here Dave Serf over-rode the temptation to go for par by laying up for a bogie. Good move. Now we know why Des wore that headband for the last round! 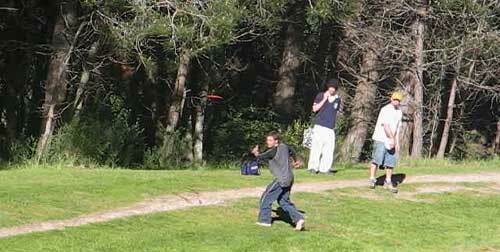 The bigger brother of the Waiheke lads, Brett Hailstone confidently pots yet another birdie on the 15th. 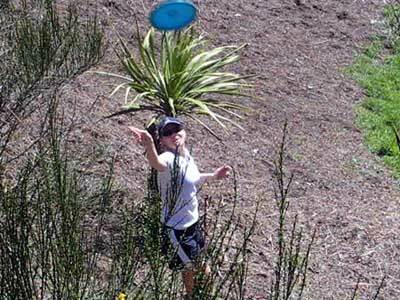 Showing the style of a golfer who knows his discs, Brett constantly shanked his Beast to land just beyond the pin. That being said, he still needed to hold it together from the brush to complete the important eagle. 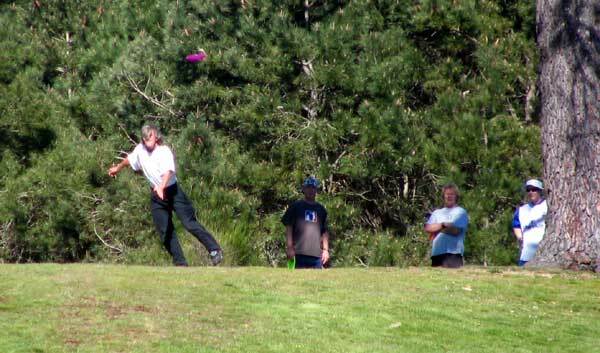 Our regular photographer Len Skap shows the power of the zoom on his new Canon by catching this shot of Serf teeing off on the elevated tee of hole 6 watched by golfing buddy Baz 'Soulman' Keene. 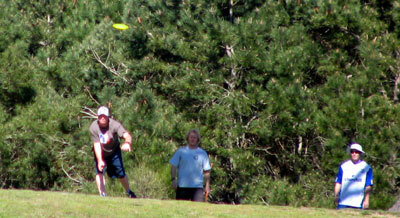 Delightful Disc Diva Debbie makes a good recovery from a dodgey tee shot on hole six. A relative beginner, Deb found the long Spa Park course quite testing. Juan Unda shows his classic putting style in front of the mighty Waikato River on the eighth. Brendon leans into a big one on the eighth. 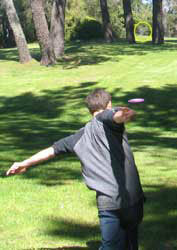 The happy Ultimate dude makes it along to a disc golf tournament when he can - much to the delight of the disc golf gals! Its a long way there - but what a spectacular hole. 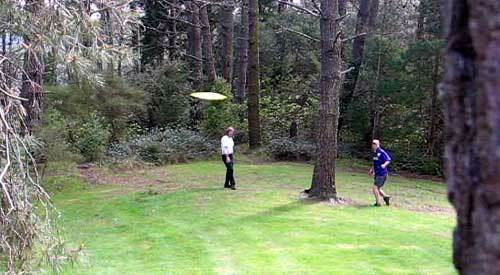 Here's Freaky Styley man Jim trying to make the shank shank as the right hander tries to curve around the large tree in front of the 15th tee. More on the newly wed's and his Ace later. Some say it was the fact Juan Unda was there. Or was it Des and his stunning haircut? Either way, this group had the largest gallery. 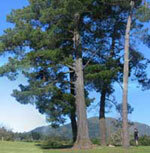 Here Des drives on nine next to the Waikato River. 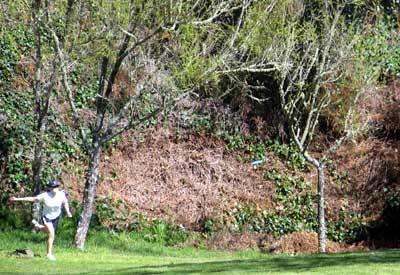 Hole 10 and Dave Serf throws a bit of a shank for his second approach shot. With the basket tucked in a wee tree peninsula, the tenth is a great challenge. 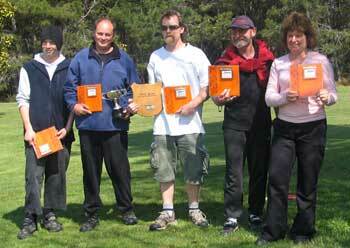 Congratulations to Bob for designing the Spa Park Disc Golf course. The sun shines warm and fine on ex Waikekian Nigel Hailstone. The brotherly battle with Brett was one of the great stories of the Gentil Sport Classic. 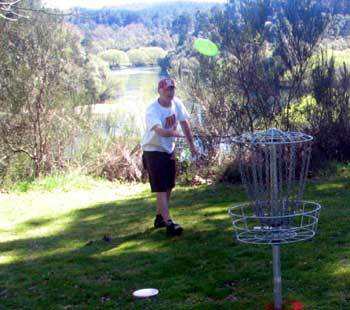 Here 'Waiheke' drives a styley one up the fairway on the ninth. This year, Gentil Sport placed the basket a few metres further on to test the enthusiastic golfers. 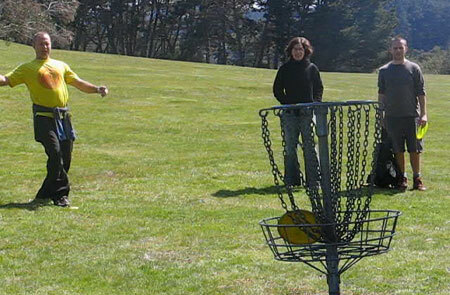 Delightful Disc Diva Debbie makes a good recovery from a dodgey tee shot on hole six. A relative beginner, Deb found the long Spa Park course quite testing: "If not for that good looking Mexican in my group who helped me along and ripped himself up in the blackberry, I think I wouldn't have made it. I owe it all to Juan Unda." Deb makes a recovery from the rough on 10. 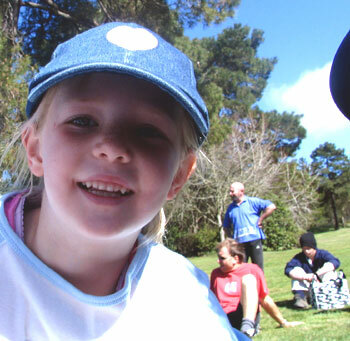 Wellingtonian Ultimate player Carsen showed great disc skills - as most of them do. This towering 1.98m athlete was light footed and accurate around Spa Park. Deb takes in the skills of Superstar Scarbrough. Steve, however, was the first to admit he did not have a good tournament. Testament to the ol' saying - 'Out of play, out of form.' Steve hasn't been out on the courses much lately. 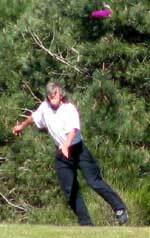 Nimble Nigel Hailstone gives his disc plenty of spin to ensure a straight flight towards the pin on hole 15. "I'm here to support my Dad!" Bridget could be seen whizzing around the park giving her paternal disc golfer the encouragement to do well - go Daddy Dave Serf! 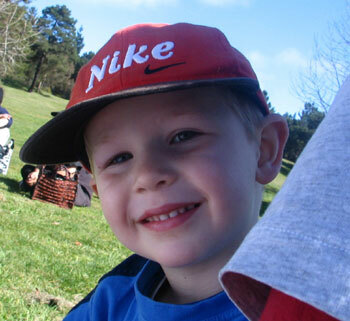 "Pretty soon I'm gonna be like my Dad and play disc golf- yeah!" 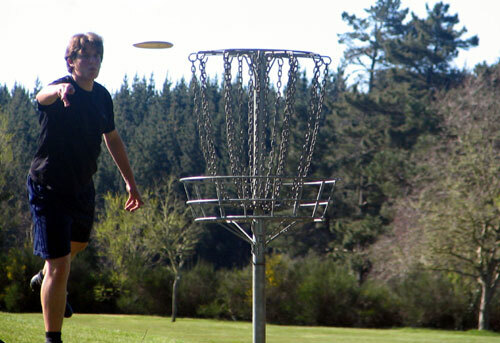 Yes, look out for Cam Serf on the New Zealand disc golf courses some time soon in the future. 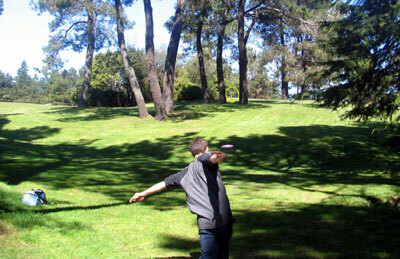 Juan Unda does the Mexican Shuffle on 13 - the styley follow-through that ensures good spin on the disc. No matter how your round is going, a 15m putt that slams into the chains in enough to make any golfer pleased. Here Serf does just that on the thirteenth watched by Juan Unda. It's that man Brendon Love again, this time potting a nice birdie on the 15th. This shot is taken from a vid - Brendon knows how to lay it on for the camera. Good to see you at Taupo Mr Love. 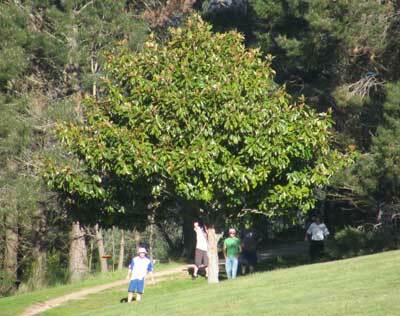 After a day's golf in bare feet, Super Shane turned up on Sunday in sturdy Bata Safemate gumboots! Here he fires a nice straight drive on the 17th. 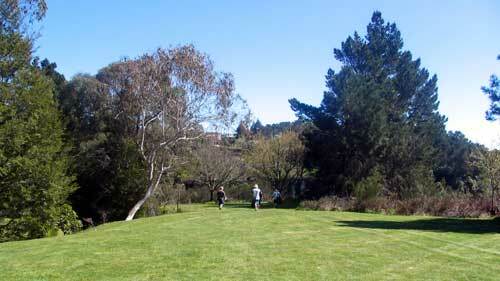 This was a hole where many golfers hoped to get past the tall pines and place their disc close to the pin. And one golfer. 'Ace' Jim did even better with a Hole In One - well done Jim! 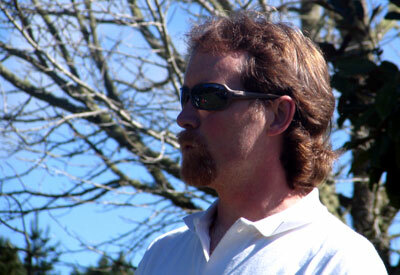 At the briefing, we heard some good news from American Disc Golfer Scott Caesar who is now residing in New Zealand. 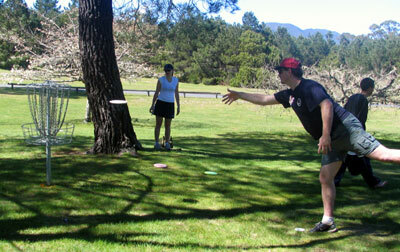 Scott will be organising the 2006 nationals in his home town of Rotorua - disc golf in mountainbike megatown RotoVegas - yeah! That's Carsen driving on 18. 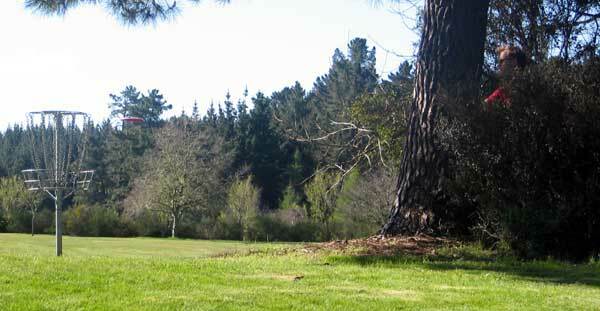 Driving between some tall pine trees, the 18th was a birdie opportunity - if you stayed off the road! "And starting on hole seven.." Players listen intently as Bob details the agenda for the day. Wonderful conditions and arguably the best course in the Southern Hemisphere, this tournament attracted a record 37 golfers - all happy to be there. American Scott Caesar is now resident in New Zealand. 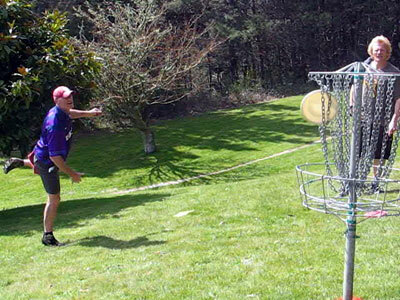 Having played on more than 300 different disc golf courses and having run over 100 events, Scott brings his wealth of knowledge and enthusiasm to Aotearoa. Ka Pai! 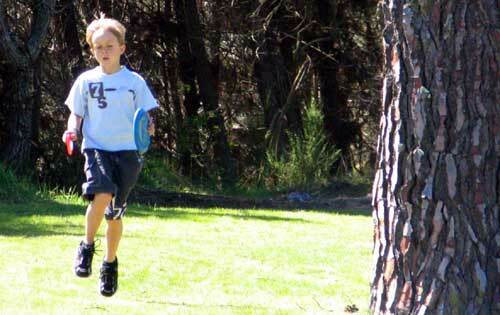 Once again the energetic Toby G was at the tournament skipping his way around the course. Toby's agressive yet accurate putting style is a hemisphere away from his dad's lay-up approach to the game. How many times did you not make it past the Toby tees? From left to right: Bruno Whale (Junior), Blair Joines (Open), Scott Caesar (Masters), Pete Boyle (Grand Masters) and Fiona 'Ming' Menzies (Womens).